سیالی, امیره, حاتمی, محمدرضا, شمالی, ظاهرحسین. (773). بررسی عوامل موثر بر وارون‌سازی یک چشمه پیچیده زمین‌لرزه‌ای با استفاده از لرزه‌‌نگاشت‌‌های مصنوعی. مجله ژئوفیزیک ایران, 7(4), 134-148. امیره سیالی; محمدرضا حاتمی; ظاهرحسین شمالی. "بررسی عوامل موثر بر وارون‌سازی یک چشمه پیچیده زمین‌لرزه‌ای با استفاده از لرزه‌‌نگاشت‌‌های مصنوعی". مجله ژئوفیزیک ایران, 7, 4, 773, 134-148. سیالی, امیره, حاتمی, محمدرضا, شمالی, ظاهرحسین. (773). 'بررسی عوامل موثر بر وارون‌سازی یک چشمه پیچیده زمین‌لرزه‌ای با استفاده از لرزه‌‌نگاشت‌‌های مصنوعی', مجله ژئوفیزیک ایران, 7(4), pp. 134-148. سیالی, امیره, حاتمی, محمدرضا, شمالی, ظاهرحسین. بررسی عوامل موثر بر وارون‌سازی یک چشمه پیچیده زمین‌لرزه‌ای با استفاده از لرزه‌‌نگاشت‌‌های مصنوعی. 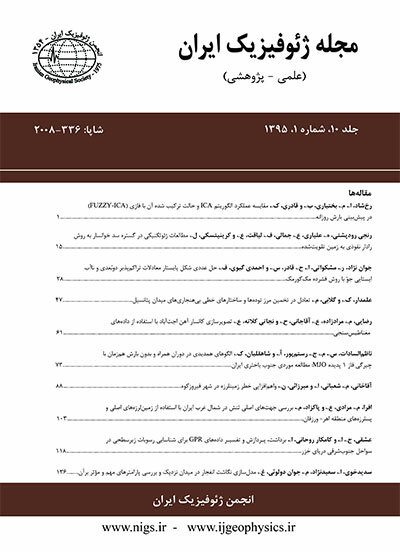 مجله ژئوفیزیک ایران, 773; 7(4): 134-148. انحراف زمین‌لرزه‌ها از سازوکار دو زوج نیرو بسیار مهم و یک ابزار حساس برای بررسی فرایندهای چشمه آنها است. این باور وجود دارد که سازوکار کانونی زلزله‌ها نه تنها اطلاعاتی در مورد میدان تنش فراهم می‌سازد بلکه در مورد پدیده گسیخت مانند بازشدگی ترک‌ها نیز اطلاعاتی به‌دست می‌‌دهد، به همین علت انحراف از سازوکار دو زوج نیرو، مورد بررسی قرار می‌گیرد. از طرف دیگر تغییرات زمانی پیچیده آزاد‌سازی انرژی، مانند جابه‌جایی‌های سطحی غیریکنواخت در امتداد برونزد گسل‌های سطحی، یک خصوصیت گسیخت در زمین‌لرزه‌های بزرگ است. به علت اهمیت نحوه گسیخت در یک زمین‌لرزه و بررسی اینکه یک رخداد با درصد غیر دو زوج نیروی زیاد می‌تواند شامل چند زیررخداد با فواصل مکانی و زمانی کم باشد، شناخت این موضوع نیازمند بررسی دقیق‌تر با استفاده از لرزه‌‌نگاشت‌های مصنوعی و تحلیل آن است. در این تحقیق لرزه‌‌نگاشت‌های مصنوعی با استفاده از مجموعه نرم‌افزاری CPS تولید و لرزه‌‌نگاشت حاصل از زمین‌لرزه اصلی و زیررخداد آن با همدیگر جمع و لرزه‌‌نگاشت حاصل مبنای کار واقع شده است. در واقع با مدل‌سازی یک چشمه با درصد غیر دو زوج نیروی زیاد (حاصل جمع دو زیررخداد 100 درصد دو زوج نیرو)، توانایی روش ISOLA برای تشخیص دو زیررخداد با سازوکارهای متفاوت، تحلیل می‌شود. نوار بسامدی، مدل سرعتی پوسته‌، نسبت گشتاور زمین‌لرزه‌ها و میزان نوفه افزایشی به‌منزلة عوامل تاثیرگذار بر بازیابی موفیقت آمیز دو زیررخداد تعیین شد. In many earthquake source studies, the seismic source is assumed to have a double-couple (DC) source mechanism, matching shear motion on a planar fault. Observations of increasing quality and coverage, however, resolve departures from the DC model for many earthquakes and find some earthquakes, especially in volcanic and geothermal areas, that have strongly non-DC mechanisms. Burdick and Mellman (1976) used a time-domain inversion method to determine some of the complexity of the source time function. Several attempts have been made to explain the complexity of body waves from large earthquakes by using a multiple event model (Kikuchi and kanamori, 1982). Deviation of earthquakes from the double-couple (DC) mechanism is an important, but delicate tool to study their source processes. It is believed that the earthquake focal mechanisms not only provide information regarding the stress field, but also give information about the rupture phenomena e.g. crack opening. Hence, the deviation from the double-couple mechanism is a matter of investigation. In fact, the study of the non-DC components makes opportunity to provide information about the earth processes. This information may be used to facilitate the operation of the geothermal energy and help predict volcanic activity. On the other side, the complex time history of energy release is a common attribute of large earthquake failures, as is the presence of non-uniform surface displacement along the outcrop of surface-breaking faults. An interesting topic is the search for the connections between the non-DC events, multiple-double-couple events, segmentation of faults and their fractal properties. Critical papers emphasize difficulties in obtaining reliable non-DC components, e.g. due to noise, poor station coverage or incomplete structural models. Understanding non-DC earthquakes is important both for studying the process of faulting in detail and for identifying nonshear-faulting processes that apparently occur in some earthquakes. To assess the non-double-couple component, a new method is suggested, i.e., a hierarchic grid search of the centroid position and time, during which the double-couple percentage (DC%) convergence is studied (Sokos and Zahradnik, 2008). This article uses the iterative deconvolution of multiple point sources, based on Kikuchi and Kanamori (1991), often used to study complexity of earthquakes .The method was modified for regional distances by Zahradnik et al. (2005). The modification involves the full Green’s functions (Bouchon 1981, 2003). Possibly complex events are represented by multiple point source models, which may represent their isolated asperities (Zahradnik and Sokos, 2008). ISOLA calculates the moment tensors (MT) by the least-square fitting of the complete waveforms in the time domain (Zahradnik and Sokos, 2005). Due to the significance of an earthquake rupture process and investigating whether an event of high non-DC percentage can consist of several subevents with slight spatial and temporal intervals, this survey involves more accurate investigation using synthetic seismograms and their analysis. In this study, synthetic seismograms are produced using CPS software package and the seismograms of the main earthquake and its subevent were summed together and the resulting seismogram provided a basis for further studies. In fact, by modeling a source of high non-DC percentage (resulted from summing two 100% DC subevents), the ability of ISOLA to distinguish two subevents with different focal mechanisms is analyzed. Frequency band, crustal velocity model, moment ratio of earthquakes and the added noise value are determined as factors affecting successful retrieval of the two subevents. Aki, K, 1968, Seismic displacement near a fault: J.Geophys. Res., 73, 5359-5376. Aki, K., and Richards, P. G., 2002, Quantitative Seismology Theory and Methods: Second Ed., University Science Book. Haskell, N. A., 1969, Elastic displacements in the near-field of a propagating fault: Bull. Seism. Soc. Am., 59, 865-908. Herrmann, R. B., 2002, Computer Programs in Seismology http://www.eas.slu.edu/eqc/eqccps.html. Imamura, A., 1937, Theoretical and Applied Seismology: Maruzen, Tokyo, 358 pp. Kanamori, H., 1972, Determination of effective tectonic stress associated with earthquake faulting, the Tottori earthquake of 1943: Phys. Earth planet, Interiors 5, 426-434. Kanamori, H, and Stewart, G. S., 1978, Seimological aspects of the Guatemala earthquake of February 4, 1976: J. Geophys Res., 83, 3427-3434. Kikuchi., M., and Kanamori, H., 1982, Inversion of complex body waves: Bull. Seism. Soc., Am., 72(2), 491-506. Kikuchi, M., and Kanamori, H., 1991, Inversion of complex body waves -III, Bull. Seism. Soc. Am., 81, 2335-2350. Burdick, L. J., and Melman, G. R., 1976, Inversion of the body waves from the Borrego mountain earthquake to the source mechanism, Bull. Seism. Soc. Am., 66, 1485-1499. Bouchon, M, 1981, A simple method to calculate Green’s function for elastic layered media: Bull. Seism. Soc. Am., 71(4), 959-971. Fukao, Y., 1972, Source process of the large deep-focus earthquake and its tectonic implication- The western Brazil earthquake of 1963: Phys. Earth planet, Intriors 5, 61-76. Miyamura, S., Omoto, S., Teisseyra, R, and Vesanen, E., 1964, Multiple shocks and earthquakes series pattern: Int. Inst. Seismol. Earthquake Eng. Bull 2, 71-92. Rial, J. A., 1978, The Caracas, Venezuela, earthquake of July 1967: a multiple-source event: J. Geophy. Res., 83, 5405-5414. Wyss, M., and Brune, J. N., 1967, The Alaska earthquake of 28 March 1964: a complex multiple rupture: Bull. Seism. Soc. Am., 57, 1017-1023. Zahradnik, J., Serpetsidaki, A., Sokos, E., and Tselentis, G.-A., 2005, Iterative deconvolution of regional waveforms and double-event interpretation of the 2003 Lefkada earthquake, Greece: Bull. Seism. Soc. Am., 95, 159–172. Zahradnik, J., Sokos, E., Tselentis, G.-A., and Martakis, N., 2007, Non-double-couple mechanism of moderate earthquakes near Zakynthos, Greece, April 2006: Explanation in terms of complexity: Geophysical Prospecting 56, 341–356.